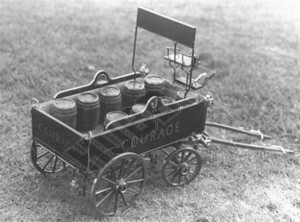 For 50 years this'Courage' dray with it's superb shires has been taking top prizes at shows through out the country. It can be fitted with shafts for a single horse,or a central pole for a pair. Details of all the fittings including barrels are shown. The model could be painted in the Courage livery of maroon and scarlet, or looks fine in varnished wood with brass fittings.